Photograph of a “Crewe Type” 2-4-0 locomotive. The photo was taken from home made Christmas Card for 1949 produced by John Maxwell Dunn (1898-1969). He was Running Shed Foreman at Bangor from 1944 to 1958. 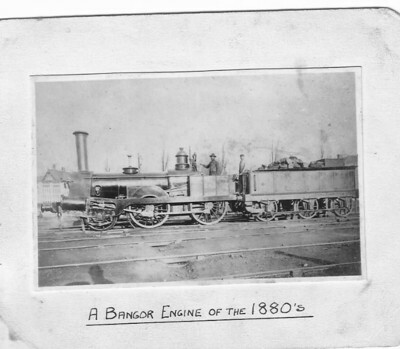 The photograph is titled “A Bangor Engine of the 1880‘s”. However the location is not Bangor-the location is too flat. The photo may well have been taken in the 1870‘s. Does a member have any ideas as to the location? There is a gable end to a house and what appears to be a crossing (Foot or Vehicular?) on the left. From the position of the sun the photo was taken looking north. Could it be one of the many yards around Crewe?. This looks like one of Richard Bleasdale‘s photographs. The shadow (bottom left) of a bowler-hatted gent and the top of his camera are like three of his taken in the 1870s: Crewe Goods No 137, Samson No 608 ‘The Earl of Chester’, and Newton No 1667 ‘Corunna’. All have shadows from a low sun behind the photographer. Only ‘Corunna’ has any background detail - unidentified, but not the same as this photo, while the other two were taken together at some other spot, but possibly in the same yard. These three are in Bleasdale‘s list of January 1881, as is Crewe Goods No 327, which looks likely to be the engine in the mystery photo. This one isn't in the Locomotive Publishing Co (Ian Allan) list of 1958, which includes most of Bleasdale‘s photos, so perhaps the negative had been lost or destroyed. If so, prints will be rarities, and certainly I have never seen this one before. I cannot identify the location, but from the foreground shadow from a low sun, the engine must be pointing more-or-less northwards. One oddity: there doesn't appear to be a lamp socket on the bufferplank. Another oddity is that the engine appears to be painted with lining - the pale lines on the boiler bands suggest it was painted in 1876 at the latest. Photographs of Old Crewe Goods in black - and with lining-out - seem to be unusual; at least I can't think of another example.